Framing lumber trading developed a stronger pulse for those serving markets graced with warmer and drier weather. This was the case for western mills active in Southern California and Southern Pine mills selling into the South and the lower half of the Midwest. Winter kept a hold on northern markets, where distributors and dealers dug out from recent snowstorms. Varying activity produced a mix of price trends, but the Random Lengths Framing Lumber Composite Price slipped $2 for the week to $362. 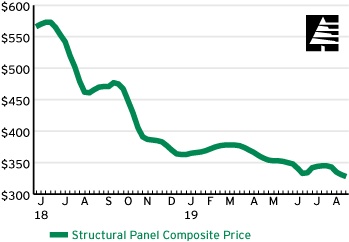 Structural panel prices shifted mildly amid measured trading. Price trends were mixed in OSB. Some northern mills with short order files opened to discounts. Canadian producers sometimes sold blocks at double-digit discounts, but pulled buyers into the market for the first time in weeks. 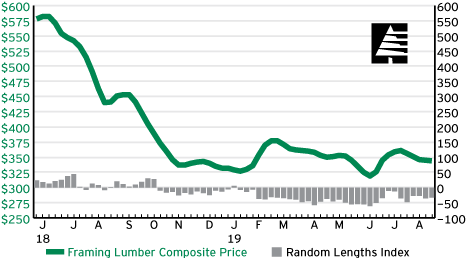 Southern Pine plywood trading was steady enough to keep prices of rated sheathing firm to slightly up, but demand was inconsistent. Western Fir plywood trading was more active in the West, as warmer and drier weather generated more inquiries.